Houston has a massive man-made flooding problem that threatens the long-term economic viability of our region and the safety of its residents. Difficult choices must be made by our leadership and our citizens in order to end our on-going flooding threat. Several concerned organizations asked themselves the question, "What would it take to end Houston's man-made flooding?" This petition and the supporting material are the results of that inquiry. We hope that by signing our petition your public support can convince our elected officials - from all over the region - that this is an issue of vital importance that demands their utmost attention to do what needs to be done to protect Houston-area homes and businesses. Fill: Only existing dirt on-site should be used for increasing building elevation. Detention: Including capacity from all drainage systems, it is recommended that there must be a total of 640 acre-feet of detention capacity within each square mile of the H-GAC area (100% mitigation); currently, various county agencies require from 320 to 640 acre-feet of detention within each square mile. Modeling: Before any drainage project is initiated, accurate and up-to-date elevations and two-dimensional flow modeling should be used to understand stormwater flow better so that flooding is not simply moved elsewhere. Develop an area-wide actively maintained modeling system so that accurate analysis can be done on every project prior to shovels in the ground. Begin actively anticipating future development patterns and detention needs, particularly in the upper reaches of watersheds. We've made a few tweaks to the petition you signed. 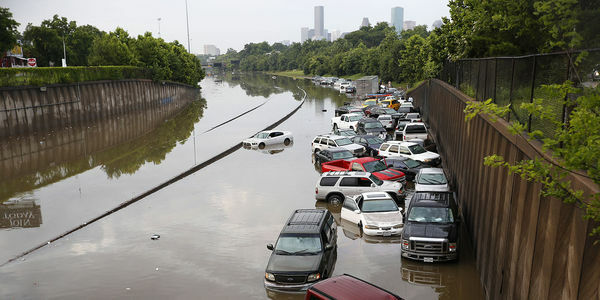 Most notably, the title should be, "End Man-Made Houston Flooding." Please forgive the error. We certainly understand that we cannot end all Houston flooding.